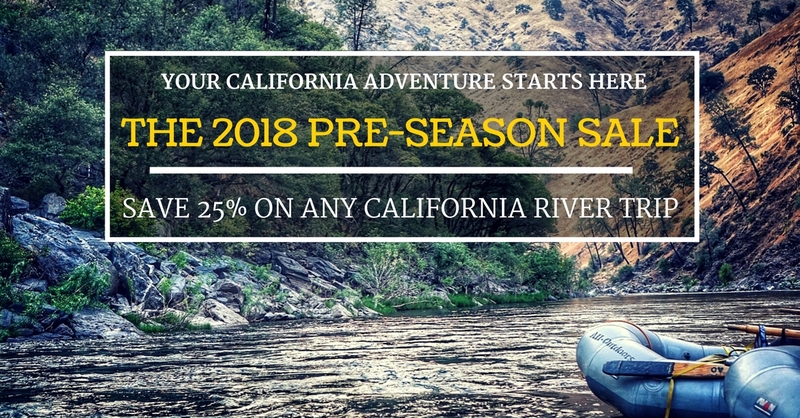 During our most popular sale of the year, you can take advantage of a tremendous 25% discount on any California whitewater rafting trip we offer during the upcoming season. Why is our annual Pre-Season Sale Our Most Popular (and Flexible) Sale of the Year? A Big Discount: Save 25% when you book before the end of the sale on Wednesday, January 31st at 5pm. Flexibility: The discount applies to all reservations and Rafting Trip Certificates for any California river trip we offer during the upcoming season! Any River: Choose one of ten rivers we run in California this season. Any Level of Difficulty: Book any trip option we offer from our Tom Sawyer Float Trip for young children and their families, to our most technically advanced Class V trip on Cherry Creek. Any Number of Days: We offer one-day trips, shorter morning or afternoon “Express” trips and multi-day overnight adventures that either feature car-camping access or a true wilderness riverside camping experience. Any Number of People You Want: If there is still room on the trip date you choose, there are no limitations on how many people you include on your trip; the discount applies to everyone until the sale is over! Book As Many Trips As You Want: There is no limitation to how many discounted trips you can book for the upcoming season! Want to go rafting on every river we offer this year? (Yup, so do we!) Book it before the sale ends and save 25% on every trip! * Excludes Guide School or trips conducted outside of California. Limited to availability of specific trip options and dates. How To Save 25% Now: Book Your Trip, or Purchase Discounted Rafting Trip Certificates and Choose Your Trip Later! Save 25% on any 2018 river trip when you make a reservation or purchase Pre-Season Rafting Trip Certificates for yourself or as a gift. Ready to make your reservation? You can reserve over the phone, or book your trip online. All reservations for the upcoming rafting season made by 5pm on Wednesday, January 31st, 2018 automatically get a 25% discount, no matter how many people are on your trip, or which river you choose! If you’re not ready to make a reservation, Rafting Trip Certificates give you the flexibility to save money now and make your rafting trip reservation whenever you’re ready. This sale only happens once a year and the deadline is getting closer. Don’t miss you chance to get yourself a Rafting Trip Certificate or make a reservation now! * Some restrictions and exclusions apply. See the official Pre-Season Sale page for a full explanation and FAQ. No matter how you choose to take advantage of the sale, we’re here to help if you have questions. Don’t hesitate to call, email or Live Chat with an All-Outdoors California River Specialist during our off-season business hours Mon-Fri: 10am – 4pm (between January 22 and 31, 2018, business hours are extended to Mon-Fri: 9am – 5pm).